When it comes to luxury, Seychelles has a wealth of beautiful hotel options. From luxurious resorts to Robinson Crusoe island experiences, Just Seychelles knows where to find it. Private butler, idyllic beachside location, spectacular diving or world-class spa? With 26 years experience tailor-making Seychelles holidays, talk to our knowledgeable team and discover your dream Seychelles vacation. Many of our luxury hotels are also great for a family holiday in Seychelles; as well as Kid's clubs and daily activity programmes, giant tortoises and turtles mean Seychelles provides a unique experience for children. 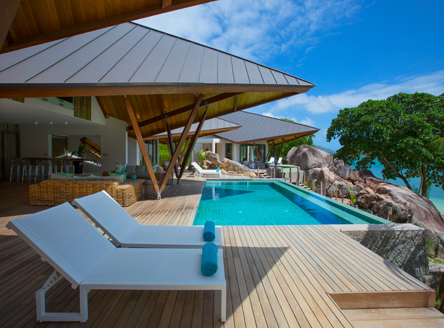 We also now offer the fabulous Villa Deckenia, a luxury private villa sleeping up to 12 guests on Praslin Island. 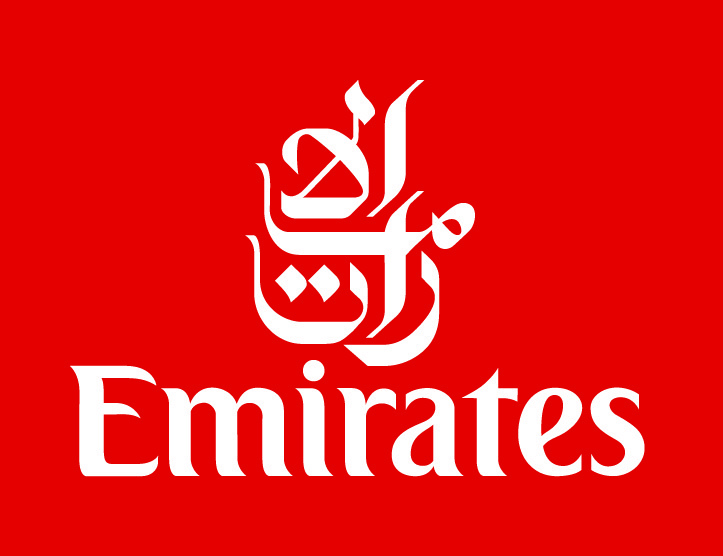 Browse our selection of the best resorts, then call us for a detailed quotation. Raffles Praslin Seychelles - 5* deluxe resort with villas and private pools! Luxury resort on the second island of Praslin. As well as superb cuisine and great facilities, superb offers mean that it offers excellent value. Enchanted Island Resort - private island paradise with just 10 pool villas! Just a 10-minute speedboat ride from the main island of Mahé means that this small private island offers an island sanctuary experience, and yet is just a matter of minutes from the other 'attractions'. 5-star deluxe resort set in a breathtaking location beside Anse Intendance Bay in the south-west of the main island of Mahé. 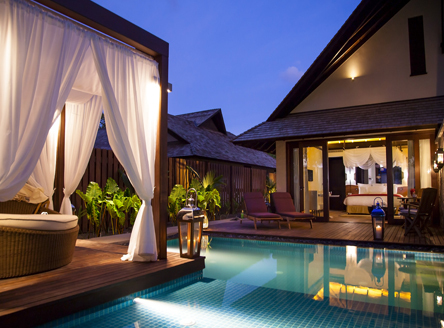 All Villas have private plunge pool and the award-winning Banyan Tree Spa should not be missed. One of the premier deluxe hotels on Mahé island, offering a choice of sumptuous pool villas - all overlooking the stunning horseshoe-shaped bay of Petit Anse. Luxurious resort on Mahé island with private butler service. The emphasis at Maia centres on total relaxation and rejuvenation. This is more than just a tiny island resort; it's also a private nature reserve situated just a few miles off the west coast of Praslin Island where luxury accommodation awaits along with all the island ecology. True barefoot paradise, where many famous names have stayed! All eleven exquisitely designed villas have been lovingly hand-crafted on the island from local wood and stone. Stays here are truly on an All Inclusive basis! A unique island experience... exotic, exclusive and isolated! Only 20 minutes by helicopter from Mahé, it is an ecology haven. 16 individually-designed villas and fine dining mean that you will want for little on a stay here! Villa Deckenia - Luxurious private Villa on Praslin... with chef & butler! A gorgeous private villa nestled amongst giant granite boulders, beside a lovely sandy beach. With 5 bedrooms, the property sleeps up to 10 adults & 2 children. Rental is on Full Board basis and includes a Chef and Butler. A lovely island resort just a 10-minute boat ride from the main island of Mahé. A choice of villa accommodation includes pool villas and there's a good choice of land and water sport activities. A wonderful private island paradise. Just a 30 minute flight from Mahé island, and yet you'll feel as though you're in another world! Delightful accommodation and superb cuisine complete this idyllic experience. Lovely island resort on the stunning island of Silhouette, just a 40-minute boat ride from Mahé. Excellent villa accommodation, including some pool villas, plus a good choice of restaurants and leisure activities. 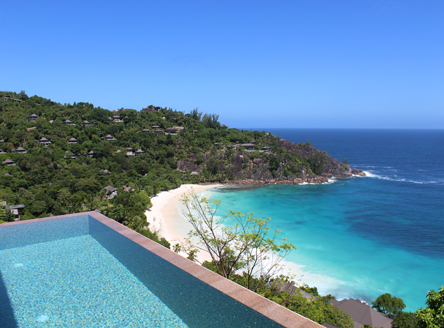 Constance Lemuria Seychelles - 5* resort with Seychelles' only golf course! On the northwest coast of Praslin, surrounded by lush vegetation, but sheltered from prevailing winds, this is the perfect choice for a luxury Seychelles holiday. It is also home to Seychelles' only 18-hole golf course. This brand new, deluxe 'boutique' hotel is set beside the polular Beau Vallon Bay on Mahe Island, offering a choice of Suites as well as luxury Pool Villas set beside the delightful beach. This famous Seychelles hotel, the world's smallest Hilton hotel in fact, features villas with lovely wood interiors. In a secluded setting, it is just a 5 minute drive to the main resort of Beau Vallon Bay on Mahé. If you're finding it hard to select just one resort, we recommend a two or three island holiday. Just Seychelles, part of Just Destinations, has been an expert in selling Seychelles holidays for 26 years. Featuring a huge range of Seychelles resorts, it's easy for us to tailor an island-hopping experience to suit. Read more about why we love the fabulous Seychelles Islands! Our team's knowledge and experience of Seychelles means that we have incredible first-hand knowledge of all the Seychelles hotels we feature. This means we can tailor your perfect Seychelles honeymoon or wedding in Seychelles. Should golf be high on your list for your luxury Seychelles holiday, then the best place to stay is the 5-star Constance Lemuria Seychelles on Praslin. This resort has Seychelles' only 18-hole, par 70 championship course and is set in stunning tropical landscape around the resort.